Long before the culture of taking photographs of what you were about to eat and putting it on facebook, myself and other artists sketched our food. For me, it all started when I was a little girl and was encouraged to keep an illustrated diary when I went on holiday. Our caravan was often parked in some deserted campsite field near a small village like Chipping Norton or Bangor on Dee, so to kill time in the evenings my sisters and I would play cards or write in our diaries. 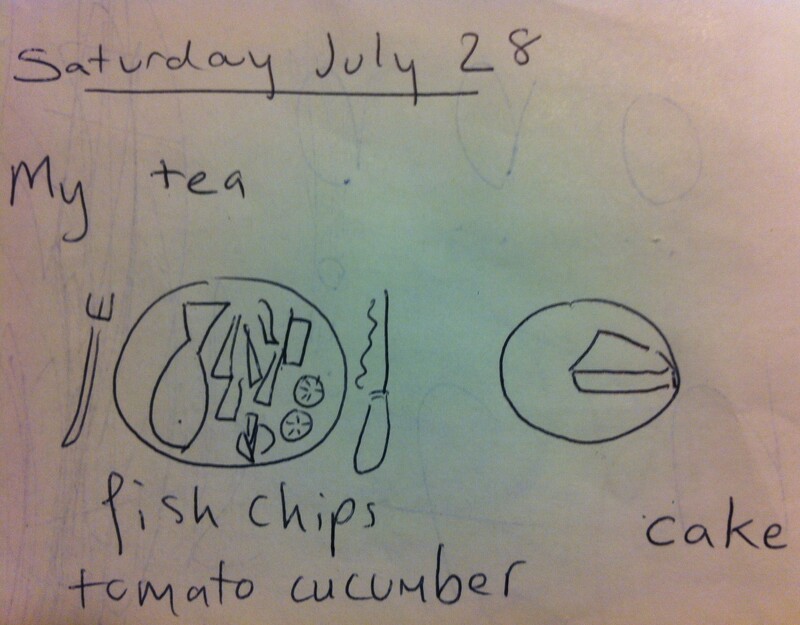 An example of my tea as drawn by me, aged 8, from one of my holiday diaries. Now, I still love painting and sketching food stuffs and always try to include images of food I have tried in my travel journals. Here are a selection of my favourite watercolours of food. My favourite food – Dragon FruitI love bright colour and shape of this fruit – beautiful (and tasty too)! Sweden’s Darlana horse on the packet of my favourite varieties of jumbo sized knäckerbröd. Interval drinks in the bar at the Stockholm Opera House. Every Day in May 2014 #14 Draw a glass of juice – Apple juice in my Keep Calm and Love Life glass. Thank you for reblogging my article. If you like this, have a look round my blog for more art similar, I really appreciate feedback from people. Also check my facebook page (https://www.facebook.com/pages/Ali-Dunnell-Travels-with-my-Art/145725862260642=).